It was great to see Celestial Dawn become a mother this week, to a lovely filly foal. CD as she was fondly known, was the founder horse of Grange Park Racing back in November of 2011. She was a real star, as not only did I breed her, but she won twice for us, as well as numerous placed efforts. Suprisingly she showed a lot of speed, winning over around 6 furlongs. I say suprisingly, as her dam, Celestial Welcome was a winner of the Old Newton Cup over 1m4f & her sire Echo of Light did all of his winning at a mile plus. This new little edition is by the very fast sire Requinto, who won the Group 2 Flying Childers, so if she inherits any of her parents speed, she could turn out to be a very nice sprinter indeed. She certainly looks a little topper & CD really looks the part as a loving mother, so here's to a bright future!! 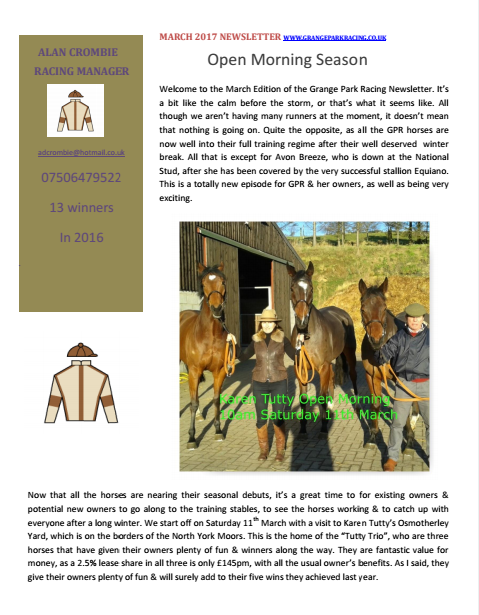 Also out this week, is the March Edition of the Grange Park Racing Newsletter. If you would like a free copy, please email info@grangeparkracing.co.uk.